BASSETERRE, St. Kitts, May 21 2013 (IPS) - As Caribbean communities grapple with the entwined challenges of climate change and food security, modern technologies offer hope that the region’s stagnating agricultural sector can be made more profitable. For the past six years, the University of Central Florida (UCF) has teamed up with the St. Kitts-based Clarence Fitzroy Bryant College (CFBC) to implement a climate change education project for sustainable development in the region. 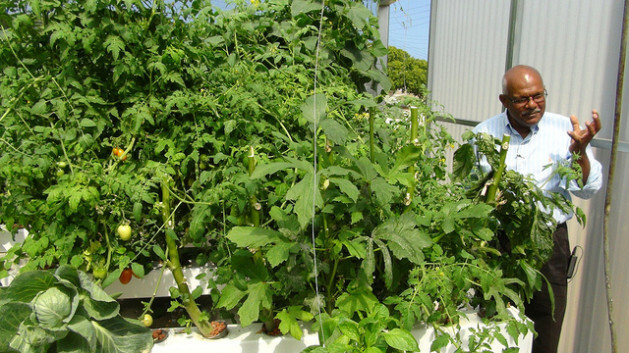 The institutions are reporting “tremendous success” using hydroponics, organoponics and hybrid-ponics, techniques that they insist are far more cost-effective. “Climate change affects us all and one of the areas that we are most vulnerable is in the field of food security, namely agriculture. So my task as part of this team was to develop models to test various scenarios to see which one would be the most significant,” Stuart La Place, a lecturer at CFBC told IPS. “Strawberries don’t usually grow in these climates but we have managed to grow them successfully and we are still growing them at the moment,” he said. Hydroponics is a technique used to grow plants without soil, instead using mineral nutrient solutions in water. Former CFBC student Candace Richards agrees these methods are more cost-effective and profitable than traditional agriculture. Noting that for a 20 by 20-foot plot, the hydroponic system costs 2,000 dollars to set up and the organoponics system 3,703 dollars, she said it’s “a worthy investment” since the estimated annual profits are in the region of 66,660 dollars after all costs are deducted. In comparison, a plot of the same size devoted to traditional agriculture produces approximately 740 dollars per month profit. “This is better than traditional agriculture that requires more land space, is more labour intensive and presents challenges that can yield fewer crops,” Richards told IPS, pointing to the added advantage of having crops all year round rather than on a seasonal basis under traditional agriculture. Using the organoponics method, it takes 45 days to get lettuce from seed to maturity, using 9.1 gallons of water; while with hydroponics, from a seed the lettuce takes 25 days to mature and uses significantly less water because it’s in a circulation system. The water keeps moving around and the only way out of that system is through the plant. Growing lettuce the traditional way – planting in the ground – the growth cycle from a seed to maturity is 55 days and uses 11.3 gallons of water for a single plant from a dripper that delivers 50 milliletres per minute. Each summer a group of UCF students visit St. Kitts and Nevis through the President’s Scholars programme at UCF to work with students at faculty at CFBC. Charlene Kormondy was among 11 UCF students who travelled to St. Kitts and Nevis in 2012 under the programme. “I was part of the agro technology team and our product was to build a shade house now known as the CFBC plant research facility,” she told IPS. “When we got to St. Kitts we worked alongside students from St. Kitts and Nevis, CFBC professors and members of the local community to construct the shade house. “It’s an example of action learning, implanting something that is a solution to a problem in the community and also generating knowledge about how to build these shade house systems and how to make agriculture more sustainable in the face of climate change, which you know could have temperature and precipitation impacts which could adversely affect crop production,” she said. Now that the facility is up and running, Kormondy said it provides many tangible benefits to the community, including health benefits because the plants and vegetables grown there are substitutes for less healthy foods. She said it can also lead to greater independence from foreign imports, and even gender equality. “Women and children are the ones who are most vulnerable to climate-related disasters and socio-economic impacts, and this kind of agricultural system allows women to participate in agriculture but also have enough energy to devote to their role as primary caregivers and that’s because the growth of these plants are more efficient,” Kormondy said. Another UCF student, Jessica Gottsleben, noted that a rise in tourism has led the economy and lucrative jobs to be less focused on agriculture, and food imports now exceed exports by a factor of four to one. “Food supply is vulnerable from these climate-related disruptions,” she noted, adding that in future years the programme will seek to create local leaders from the youth being brought into the agricultural and business communities to increase self-sufficiency and resilience. “The partnership has the potential to create jobs in existing sectors of agriculture and also create innovation in fostering jobs in areas such as agro tourism, agro processing, marketing, collecting evidence-based social data,” Gottsleben told IPS. Sixteen CFBC students are currently registered in the programme and are trained in building the hydroponic system. But UCF Professor Dr. Kevin Meehan said they are getting the wider community involved through what’s known as ‘The Take Five Programme’ that was implemented in February last year. Some 52 participants showed up over the course of three days at the CFBC campus. “A second round of ‘Take Five’ was driven by the students and they adapted it as an outreach competition to the primary schools throughout the Federation,” Meehan said. With funding from the Organisation of American States under the Special Multilateral Fund of the Inter-American Council for Integral Development, Dr. Meehan said they are now getting ready to implement the programme in Barbados, Trinidad, Guyana and at two separate locations in Haiti. The UCF and CFBC representatives participated in a two-day UNESCO Sub-Regional Meeting on the environment and climate in Nevis on May 15 and 16. It was organised by UNESCO in collaboration with the St. Kitts and Nevis National Commission on UNESCO and the Nevis Island Administration to support national adaptation policies to climate change in the Small Island Developing States of the Caribbean.